Welcome aboard the USS Furse DD/DDR 882. 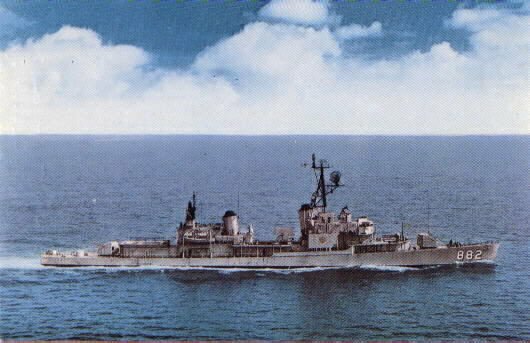 The Furse was a Gearing class destroyer named after John H. Furse. The ship was commissioned in 1945; decommissioned in 1972; sold to Spain in 1975 and scrapped in 1991. You can read more about the Furse under the history tab. If you have information that would be helpful with the ship's history, email me at naplesdlr@aol.com. The USS Furse Reunion Association holds a reunion each year in the fall at various locations throughout the U.S. The 29th reunion will be held in Mobile, AL. Oct. 16-20, 2019. Details are on the Reunion Newsletter page. Woody Woodward, now deceased, served on the USS Furse during the Vietnam War. Woody's nephew, Kevin, has created a Facebook page that features Woody's many photos taken when he was aboard 1968-70. The Facebook link is.